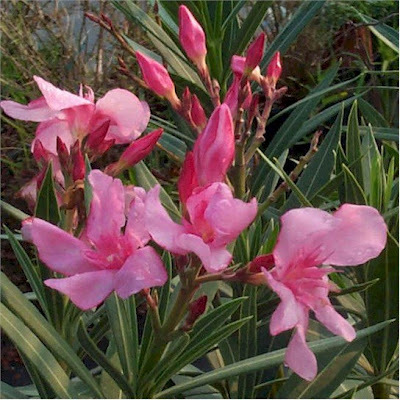 The Oleander(Nerium Oleander)shrub is a very popular plant around here in public garden areas and parks and as a potted patio plant, it is very drought resistant and flowers prolifically with five petalled flowers on long stems,in red, pink and white colours. By removing suckers at the base of the plant, and leaving just a few stems, oleander can be formed into very attractive small trees. What must be remembered is that is very poisonous, even the the smoke from burning the cuttings and wood are toxic, it has been known that people using the wood on a barbeque have poisoned themselves.